Amy Poehler is coming to Netflix, and we're not just referring to every single episode of Parks and Recreation. Back in March 2018, the streaming giant announced a new comedy called Wine Country with the Saturday Night Live alum and comedy legend, and now we finally have a trailer AND a ton of photos to feast our eyes on. In honor of Rebecca (Rachel Dratch)'s 50th birthday, Abby (Amy Poehler) plans a scenic Napa getaway with their best, longtime friends. 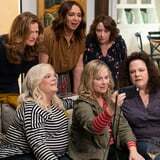 Workaholic Catherine (Ana Gasteyer), post-op Val (Paula Pell), homebody Jenny (Emily Spivey), and weary mom Naomi (Maya Rudolph) are equally sold on the chance to relax and reconnect. Yet as the alcohol flows, real world uncertainties intrude on the punchlines and gossip, and the women begin questioning their friendships and futures. Spivey, who previously worked with Poehler on Parks and Rec, also penned the script, and in addition to the core group of gal pals, Tina Fey, Jason Schwartzman, and Cherry Jones will appear in smaller roles. Clearly, the film has a lot of brilliant minds from the get-go. Watch the trailer above, then keep scrolling to see the first batch of photos from the film before it premieres on Netflix on May 10!